The good thing about these meatballs or zafrani kofta is that you can make them and freeze them in air tight bag. Whenever you want to make them just make curry and add these fried meatballs in it. You can also make this with chicken or beef mince. 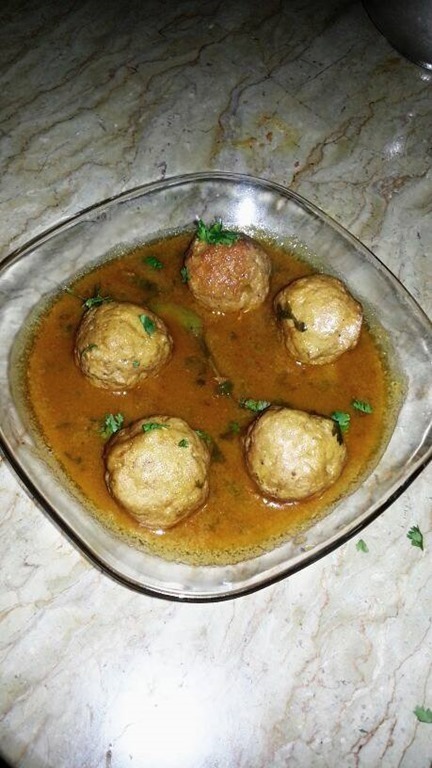 For Zafrani Kofta take half mince and boil it in one cup water. When water dries up take out the mince. Now take boil mince and half raw mine, onion, hot spices powder, roasted chick peas, poppy seeds, salt and red chilies. Put all these in chopper and grind it. Now make balls of this mixture and shallow fry them. For zafrani kofta gravy fry two onions and crush them. Put them aside. In same oil add ginger garlic paste, crushed onions,coriander, cumin seeds, red chilies powder, salt, hot spices powder, yogurt and one cup water. Mix it well and cook till it leaves oil. Put fried meatballs or zafrani kofta in this gravy and add zafran in it. Garnish with green coriander and serve hot.